Reduce Footprints: Vegan Recipe - Lacto-fermented garlic dill pickles! Vegan Recipe - Lacto-fermented garlic dill pickles! If you've followed me for any length of time, then you know that I believe that eating meatless meals is one of the easiest ways to live green. That's because the amount of natural resources involved with producing food and the cost in fossil fuels to process, transport and cook it, are less for plant-based foods versus animal-based foods. So, eating meatless meals is good for the earth! Today I have the pleasure of introducing you to Jayedee of Life in the Lost World. I've been following Jayedee for a long time. Her blog is a wonderful mix of posts ... giveaways, reviews and one of my favorite features, Menu Plan Monday – #ExtremeVeganYumminess (which includes links to recipes from all over the web). Jayedee also posts vegan recipes like French Toast, Peanut Butter Fudge and Burgers. Head over and visit Life in the Lost World ... I just know you'll like it! Jayedee has graciously agreed to share a recipe with us today. I hope you'll try it out! I’ve made tons pickles over the years, everything from good old bread and butter pickles, to kosher dills. I’ve pickled just about every vegetable you can think of, too….some successful, others not so much. Somewhere, in the back of my mind, I know I’ve been searching for the perfect deli pickle, like they used to make, at the now closed, Ronnie’s Deli, in Orlando Florida. These pickles probably come closer than any other I’ve tried, to fulfilling this dream. Crunchy, briny, fresh tasting, and garlicky with a lovely herbal note from the dill. The process couldn’t be easier. And with just a few ingredients and no special equipment, either! It’s made with a process called lacto-lfermentation. If you aren’t familiar with it, lacto-fermentation is the act of creating a lactic-acid rich environment that enables the natural preservation of some foods. Lacto-fermentation has the added bonus of making these foods more nutritious (it increases their vitamin content) and more digestible (it fosters the growth of natural probiotics). Vegetables are easily lacto-fermented by mixing them with a salt water solution and allowing them to sit in a glass mason jar at room temperature for several days before moving them to the refrigerator. 1. Wash the cucumbers. Snip off the very ends ( the blossom end contains enzymes that will make your pickles soft and squishy – yuck!) and slice them lengthwise. 4. Add distilled water to cover. 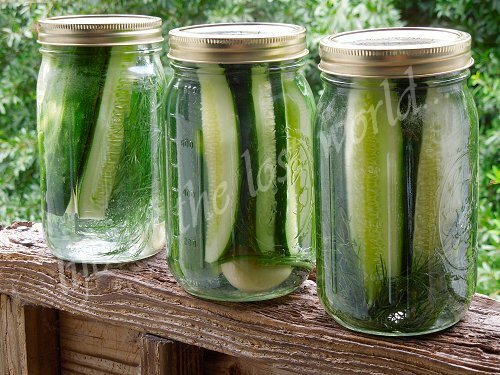 Leave about an inch of head room between the cucumbers and the top of your jar. Screw the top on the jar tightly and gently turn it upside down a few times to dissolve and distribute the salt. 5. Allow to sit at room temperature for three days. 6. After this time, go ahead and open the jar. The liquid should be pretty fizzy, don’t let that scare you, it means the lacto-fermentation was successful. If there is any type of “off smell”, discard and start again (I’m mentioning this as a caution, but also want to say that I have been lacto-fermenting for years, and I have never had anything go wrong). Go ahead and taste a pickle. The cucumbers should have a nice garlicky flavor and they should pleasant notes of dill too. 7. Store your pickles in the fridge after day 3. Lacto-fermentation will continue in the colder temperature, but at a much slower rate. That’s it. Easy as can be…trust me, your taste buds will thank you! How Green Will Your Country Be?